"YF-22" redirects here. For other uses, see YF-22 (disambiguation). The Lockheed/Boeing/General Dynamics YF-22 was an American single-seat, twin-engine fighter aircraft technology demonstrator designed for the United States Air Force (USAF). The design was a finalist in the USAF's Advanced Tactical Fighter competition, and two prototypes were built for the demonstration/validation phase of the competition. The YF-22 won the contest against the Northrop YF-23, and entered production as the Lockheed Martin F-22 Raptor. The YF-22 has similar aerodynamic layout and configuration as the F-22, but with differences in the position and design of the cockpit, tail fins and wings, and in internal structural layout. In the 1980s, the USAF began looking for a replacement for its fighter aircraft, especially to counter the advanced Su-27 and MiG-29. A number of companies, divided into two teams, submitted their proposals. Northrop and McDonnell Douglas submitted the YF-23. Lockheed, Boeing and General Dynamics proposed and built the YF-22, which, although marginally slower and having a larger radar cross-section, was more agile than the YF-23. Primarily for this reason, it was picked by the Air Force as the winner of the ATF in April 1991. Following the selection, the first YF-22 was retired to a museum, while the second prototype continued flying until an accident relegated it to the role of an antenna test vehicle. In 1981, the U.S. Air Force developed a requirement for an Advanced Tactical Fighter (ATF) as a new air superiority fighter to replace the F-15 Eagle and F-16 Fighting Falcon. This was made more crucial by the emerging worldwide threats, including development and proliferation of Soviet MiG-29 and Su-27 "Flanker"-class fighter aircraft. It would take advantage of the new technologies in fighter design on the horizon including composite materials, lightweight alloys, advanced flight-control systems, more powerful propulsion systems and stealth technology. In September 1985, the Air Force sent out technical request for proposals (RFP) to a number of aircraft manufacturing teams. The seven bids were submitted in July 1986, and two companies, Lockheed and Northrop, were selected on 31 October 1986. The two teams, Lockheed/Boeing/General Dynamics and Northrop/McDonnell Douglas, undertook a 50-month demonstration phase, culminating in the flight test of the two teams' prototypes, the YF-22 and the YF-23. The YF-22 was designed to meet USAF requirements for survivability, supercruise, stealth, and ease of maintenance. Because Lockheed's submission was selected as one of the winners, the company, through its Skunk Works division, assumed leadership of the program partners. It would be responsible for the forward cockpit and fuselage, as well as final assembly at Palmdale, California. Meanwhile, the wings and aft fuselage would be built by Boeing, with the center fuselage, weapons bays, tail and landing gear built by General Dynamics. Compared with its Northrop/McDonnell Douglas counterpart, the YF-22 has a more conventional design – its wings have larger control surfaces, such as full-span trailing edge, and, whereas the YF-23 had two tail surfaces, the YF-22 had four, which made it more maneuverable than its counterpart. Two examples of each prototype air vehicle (PAV) were built for the Demonstration-Validation phase: one with General Electric YF120 engines, the other with Pratt & Whitney YF119 engines. The YF-22 was given the unofficial name "Lightning II" after Lockheed's World War II-era fighter, the P-38 Lightning, which persisted until the mid-1990s when the USAF officially named the aircraft "Raptor". The F-35 later received the Lightning II name in 2006. The first YF-22 (PAV-1, serial number 87-0700, N22YF), with the GE YF120, was rolled out on 29 August 1990 and first flew on 29 September 1990, taking off from Palmdale piloted by David L. Ferguson. During the 18-minute flight, PAV-1 reached a maximum speed of 250 knots (460 km/h; 290 mph) and a height of 12,500 feet (3,800 m), before landing at Edwards AFB. Following the flight, Ferguson said that the remainder of the YF-22 test program would be concentrated on "...the manoeuvrability of the aeroplane, both supersonic and subsonic". The second YF-22 (PAV-2, s/n 87-0701, N22YX) with the P&W YF119 made its maiden flight on 30 October at the hands of Tom Morgenfeld. During the flight test program, unlike the YF-23, weapon firings and high (60°) angle of attack (AoA, or high-alpha) flights were carried out on the YF-22. Though not a requirement, the aircraft fired AIM-9 Sidewinder and AIM-120 AMRAAM missiles from internal weapon bays. Flight testing also demonstrated that the YF-22 with its thrust vectoring nozzles achieved pitch rates more than double that of the F-16 at low-speed maneuvering. The first prototype, PAV-1, achieved Mach 1.58 in supercruise, while PAV-2 reached a maximum supercruise speed of Mach 1.43; maximum speed was in excess of Mach 2.0. Flight testing continued until 28 December 1990, by which time 74 flights were completed and 91.6 airborne hours were accumulated. Following flight testing, the contractor teams submitted proposals for ATF production. 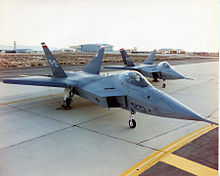 On 23 April 1991, the YF-22 was announced by Secretary of the Air Force Donald Rice as the winner of the ATF competition. The YF-23 design was stealthier and faster, but the YF-22 was more agile. 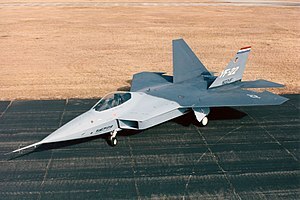 It was speculated in the aviation press that the YF-22 was also seen as more adaptable to the Navy's Navalized Advanced Tactical Fighter (NATF), but the US Navy abandoned NATF by 1992. Instead of being retired, as with the case of PAV-1, PAV-2 subsequently flew sorties following the competition – it amassed another 61.6 flying hours during 39 flights. On 25 April 1992, the aircraft sustained serious damage during a landing attempt as a result of pilot-induced oscillations. It was repaired but never flew again, and instead served as a static test vehicle thereafter. In 1991, it was anticipated that 650 production F-22s would be procured. As the Lockheed team won the ATF competition, it was awarded the engineering, manufacturing and development (EMD) contract, which would ultimately allow it to proceed with production of operational aircraft. The EMD called for seven single-seat F-22A and two twin-seat F-22Bs. On 9 April 1997, the first of these, Spirit of America, was rolled out. During the ceremony, the F-22 was officially named "Raptor". Due to limited funding, the first flight, which had previously been scheduled for mid-1996, occurred on 7 September 1997. Flight testing for the F-22 continued until 2005, and on 15 December 2005 the USAF announced that the Raptor had reached its initial operational capability (IOC). In many respects, the YF-22s were different from production F-22s. Contrary to the F-117 Nighthawk, which was initially difficult to control because of small vertical stabilizers, Lockheed over-specified the fin area on its YF-22. Therefore, the company reduced the size of those on F-22s by 20–30 percent. Lockheed recontoured the shape of the wing and stabilator trailing edges to improve aerodynamics, strength, and stealth characteristics; the wing and stabilitor sweep was reduced by 6° from 48°. Finally, to improve pilot visibility, the canopy was moved forward 7 inches (178 mm), and the engine intakes were moved rearward 14 inches (356 mm). In April 1992, the second YF-22 crashed while landing at Edwards AFB. The test pilot, Tom Morgenfeld, escaped without injury. The cause of the crash was found to be a flight control software error that failed to prevent a pilot-induced oscillation. 87-0701 – used by Lockheed as static test model. ^ a b "Fact sheet: Lockheed-Boeing-General Dynamics YF-22". U.S. Air Force. 11 February 2009. Archived from the original on 19 January 2012. Retrieved 18 June 2011. ^ Miller 2005, pp. 19–20. ^ a b Williams 2002, pp. 5–6. ^ Flight International 1986, p. 10. ^ a b c d Jenkins and Landis 2008, p. 235. ^ Flight International 1990, p. 4. ^ Flight International 1990, p. 46. ^ "YF-23 fact sheet". National Museum of the U.S. Air Force. Archived from the original on 16 July 2011. Retrieved 24 June 2011. ^ "Military Aircraft Names". Aerospaceweb.org. Archived from the original on 12 October 2009. Retrieved 26 September 2010. ^ " "Lockheed Martin Joint Strike Fighter Officially Named 'Lightning II'" (Press release). Official Joint Strike Fighter program office. 7 July 2006. Archived from the original on 15 July 2006. Retrieved 23 June 2011. ^ Williams 2002, p. 5. ^ a b c Flight International 1990, p. 6. ^ Bailey 1990, p. 34. ^ Goodall 1992, p. 99. ^ a b c d Williams 2002, p. 6. ^ Jenkins and Landis 2008, p. 236. ^ Goodall 1992, pp. 102–103. ^ Miller 2005, pp. 38–39. ^ Jenkins and Landis 2008, p. 234. ^ Goodall 1992, p. 110. ^ Miller 2005, p. 76. ^ a b William 2002, pp. 6–7. ^ Warwick 1992, p. 12. ^ "F-22A Raptor goes operational". U.S. Air Force. 15 December 2005. Archived from the original on 23 July 2012. Retrieved 24 June 2011. ^ William 2002, p. 5. ^ Pace 1999, pp. 12–13. 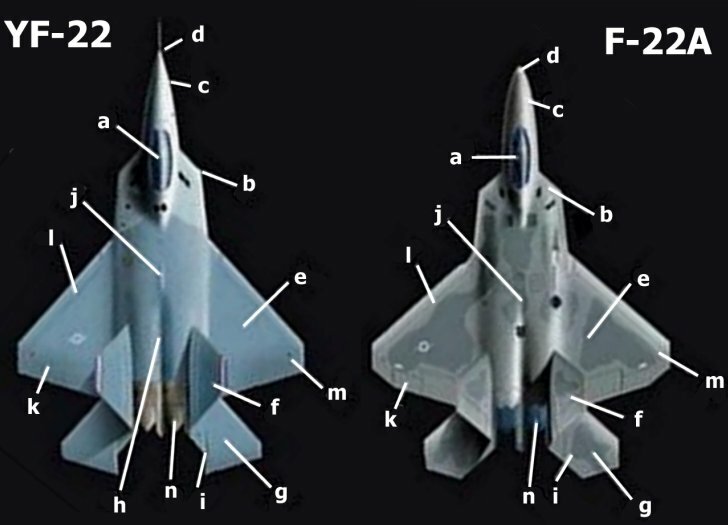 ^ "YF-22/F-22A comparison diagram". GlobalSecurity.org. Archived from the original on 23 June 2011. Retrieved 24 June 2011. ^ Harris, Jeffery and Black, G.T. "F-22 control law development and flying qualities." AIAA Paper 96-3379 (A96-35101), p. 156. ^ "YF-22 Raptor/87-700". Air Force Flight Test Center Museum. Archived from the original on 3 February 2013. Retrieved 10 May 2013. ^ "YF-22 Raptor/87-701". F-16.net. Archived from the original on 20 April 2010. Retrieved 10 May 2013. ^ Baker 1995, pp. 28–29, 32. ^ Aronstein 1998, pp. 131, 154. "ATF procurement launches new era". Flight International. London: Reed Business Information. 130 (4037): 10–11. 9–15 November 1986. ISSN 0015-3710. Archived from the original on 24 July 2012. Retrieved 24 June 2011. "Pentagon relaxes ATF design secrecy". Flight International. London: Reed Business Information. 137 (4217): 4. 23–29 May 1990. ISSN 0015-3710. Archived from the original on 5 November 2012. Retrieved 24 June 2011. "Lockheed'S ATF Stresses Agility". Flight International. London: Reed Business Information. 138 (4233): 46–47. 12–18 September 1990. ISSN 0015-3710. Archived from the original on 5 November 2012. Retrieved 23 June 2011. "YF-22 flies as ATFs head for deadline". Flight International. London: Reed Business Information. 138 (4237): 6. 10–16 October 1990. ISSN 0015-3710. Archived from the original on 21 May 2011. Retrieved 23 June 2011. Bailey, John (5–11 September 1990). "YF-22 ATF prototype set for maiden flight". Flight International. London: Reed Business Information. 138 (4232): 34. ISSN 0015-3710. Archived from the original on 5 November 2012. Retrieved 23 June 2011. Baker, David (January 1995). "From ATF to Lightning II: A Bolt in Anger: Part Two: Lockheed's YF-22A". Air International. 48 (1): 27–38. ISSN 0306-5634. Goodall, James C. (1992). "The Lockheed YF-22 and Northrop YF-23 Advanced Tactical Fighters". America's Stealth Fighters and Bombers, B-2, F-117, YF-22, and YF-23. St. Paul, Minnesota: MBI Publishing Company. ISBN 0-87938-609-6. Jenkins, Dennis R.; Landis, Tony R. (2008). Experimental & Prototype U.S. Air Force Jet Fighters. Minnesota, US: Specialty Press. ISBN 978-1-58007-111-6. Miller, Jay (2005). Lockheed Martin F/A-22 Raptor, Stealth Fighter. Hinckley, UK: Midland Publishing. ISBN 1-85780-158-X. Pace, Steve (1999). F-22 Raptor, America's Next Lethal War Machine. New York: McGraw-Hill. ISBN 0-07-134271-0. Warwick, Graham (6–12 May 1992). "Software suspected in YF-22 ATF accident". Flight International. London: Reed Business Information. 141 (4317): 12. ISSN 0015-3710. Archived from the original on 25 September 2011. Retrieved 24 June 2011. Aronstein, David C.; Hirschberg, Michael J. (1998). Advanced Tactical Fighter to F-22 Raptor: Origins of the 21st Century Air Dominance Fighter. Arlington, Virginia: American Institute of Aeronautics & Astronomy. ISBN 978-1-56347-282-4. Miller, Jay (1995). Lockheed Martin's Skunk Works: The Official History... Leicester, UK: Midland Publishing. ISBN 1-85780-037-0. Pace, Steve (1991). X-Fighters: USAF Experimental and Prototype Fighters, XP-59 to YF-23. Osceola, Wisconsin: Motorbooks International. ISBN 0-87938-540-5. Sweetman, Bill (July 2000). "Fighter EW: The Next Generation". Journal of Electronic Defense. 23 (7). ISSN 0192-429X. ——— (1998). F-22 Raptor. St. Paul, Minnesota, USA: Motorbooks International Publishing. ISBN 0-7603-0484-X. Winchester, Jim, ed. (2005). "Northrop/McDonnell Douglas YF-23". Concept Aircraft: Prototypes, X-Planes, And Experimental Aircraft. The Aviation Factfile. Rochester, Kent, UK: Grange Books. ISBN 1-84013-809-2. Wikimedia Commons has media related to Lockheed YF-22.